Truth-filled messages to inspire a better understanding of your spiritual and ethical self, and your relationship with the world. This time of year, we normally talk about our accomplishments and the successes of our community. 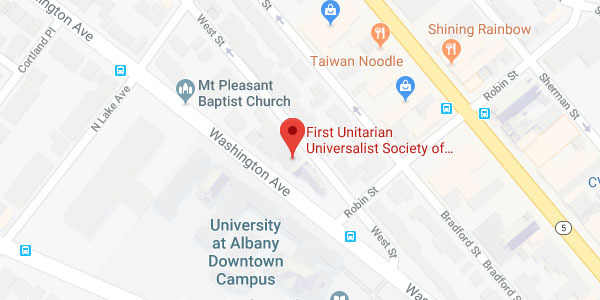 It is also a time to look forward to how we plan to carry our blessings forward for the benefit of both our congregation, UUs in the Capital Region and beyond, and the diverse community around us. To those who have and receive much, there is great opportunity to give generously and make a positive difference. With each part per million increase of carbon dioxide in the atmosphere and degree of global temperature we lock in devastating climate changes that will diminish and deplete the lives of future generations. There are individual steps we can make to slow down that process. The most important steps however must be collective changes. How can we be part of a solution? Which ones are possible now? Jesus didn’t have to go to Jerusalem. He didn’t have to overturn the tables of the money changers in the Temple. He didn’t have to wait around to get captured. Why didn’t he just teach and heal people and stay out of trouble?